Inspired by the ubiquitous bankers lamp, D38 is also a further exercise in working with very lightweight structure and use of White Optics as a paper shade material. 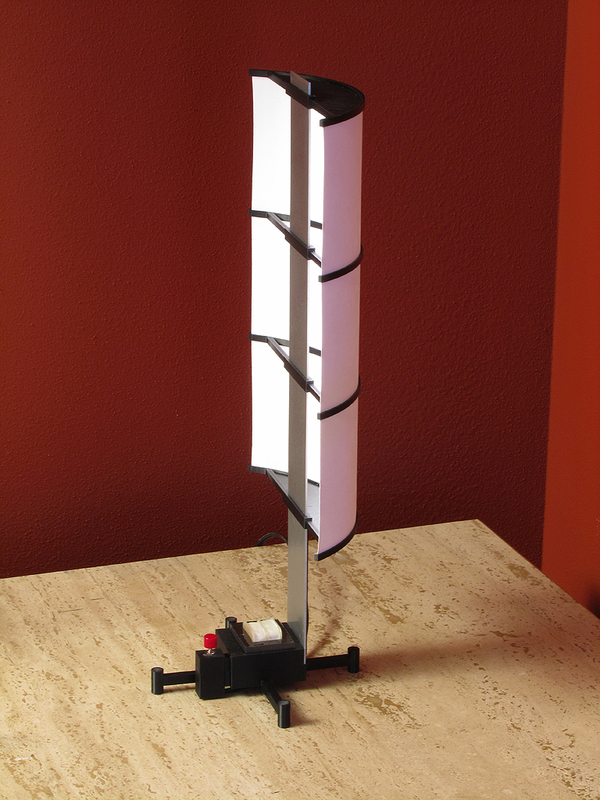 Again, for simplicity, I used a 12″ LynkLabs SnapBrite strip with its 12 1W Tesla LEDs, and a BriteDriver power supply encased in one of the leg bases. 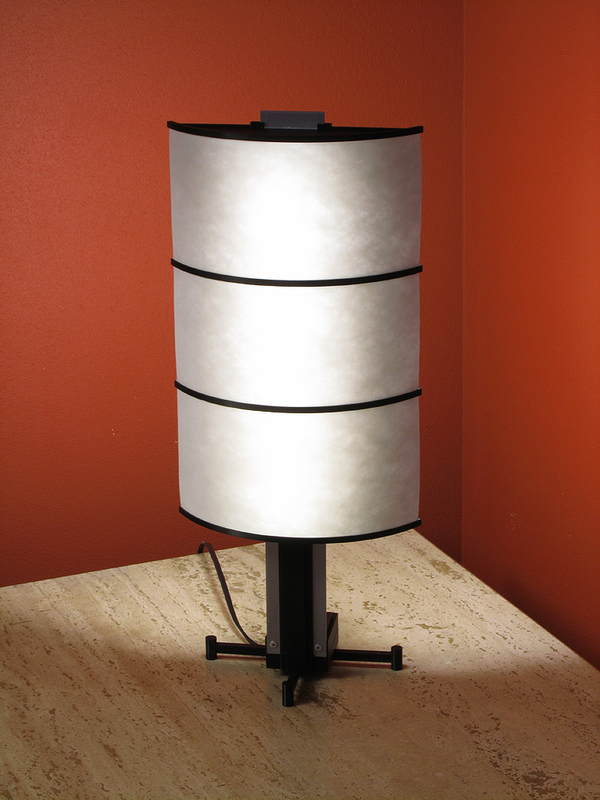 The 14″H lamp produces both direct downlight and a subtle indirect shade presence. I call Design 39 a “GeoLite Festoon Sandwich”. 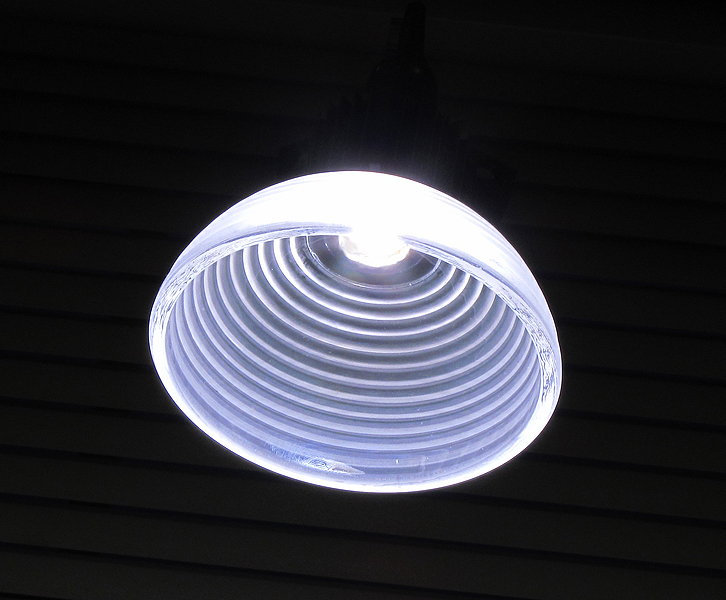 It is essentially two slices of ABS plastic with 18 1/2Watt LynkLabs Festoon LED replacement lamps, ringing a 12V 12VA transformer, controlled by a simple pushbutton switch. The switches red knob and stem are intended to look like the little toothpick with decoration sandwich shops use. This is intended to provide a little accent light (it’s only 4.5″ square and 1.75″ deep), draw curious attention, and make one smile. This is another experiment in ultra light elements that still serve a functional purpose. In this case, a vanity light for a small powder room. The cantilevered light bar houses a LynkLabs 12w Tesla SnapBrite strip, while the wall box cover houses a BriteDriver power supply. 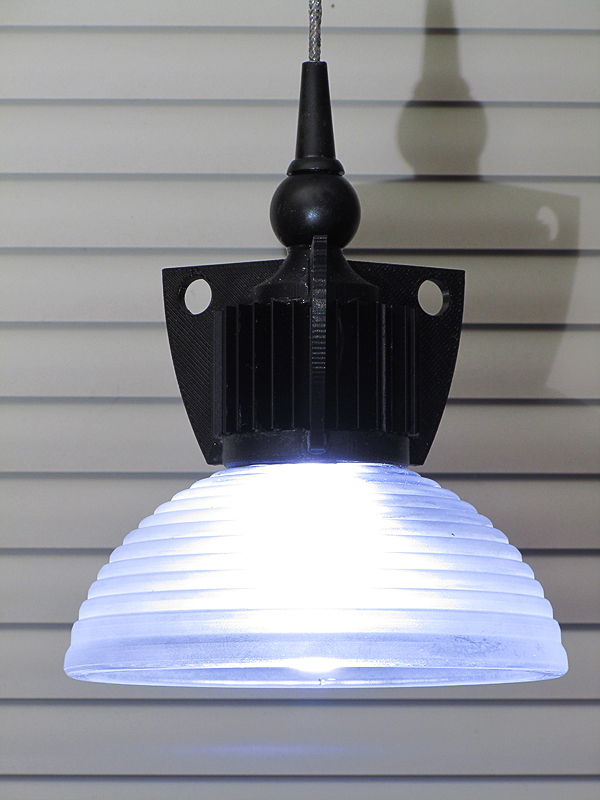 The reflector elements are covered with White Optics material to optimize light from the LED strip and to diffuse the light throughout the room. This replaced a 150W Halogen indirect reflector product, yet delivers roughly the same light into the space, saving a great deal of energy and the hassle of replacing the constantly failing halogen lamps. One compromise I had to make here was the size of the wall plate. I would have liked it to be much smaller. However, in the application destination I needed it to fill, there was an existing wall condition and junction box configuration that required a 5″ square wall plate to cover. Ideally, I would have used a small vertical outlet box, with concealed fasteners… but practical reality sometimes demands these little sacrifices. 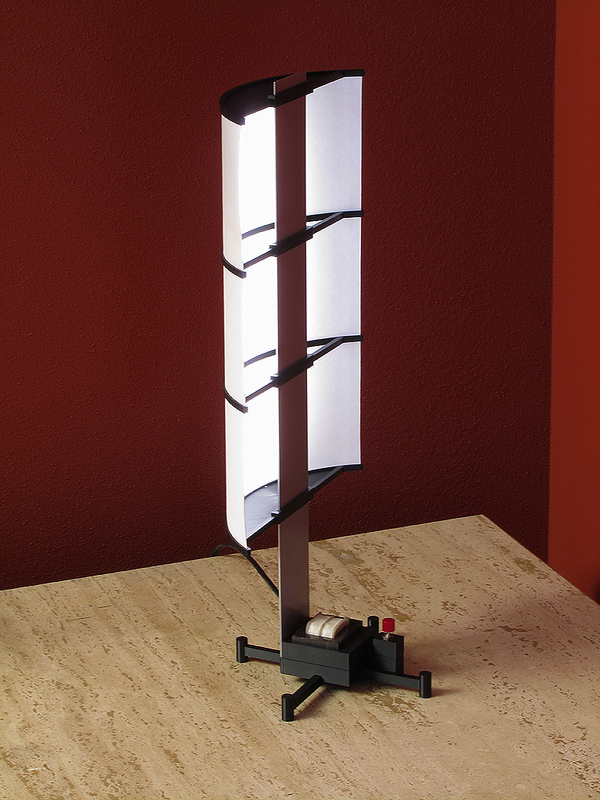 Had a thought to create something that produces the kind of light a conventional table lamp provides, with a little twist. In the middle of that I thought of a sailboat sail and how they fill with air. With these two seemingly unrelated images trapped in the skull, I sat down to design this little fixture. I had in mind something that was ultimately simple and uncomplicated, which immediately brought to mind the LynkLabs 12VAC SnapBrite strip. 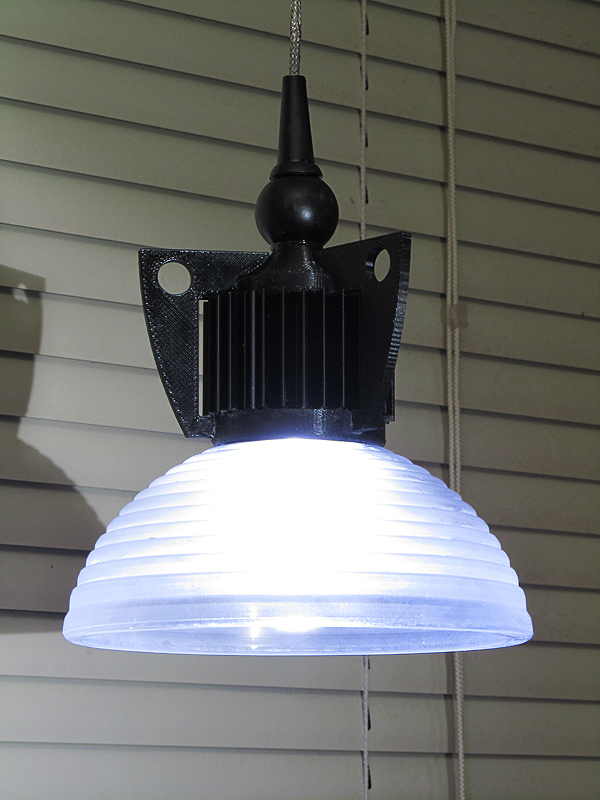 I have not found anything in all of LED-dom that gets me from wall power to LED light with less fuss. In this case, I used a magnetic 12 VA transformer, which is sized right on the money for the 12 1W LEDs on the 12″ SnapBrite strip I grabbed from the parts bin. Three parts: Switch, transformer, LED strip. Two wires between the parts, and done. The sail/shade is made from White Optics material, which is over 92% reflective and 98% diffuse, creating a soft, blended light that is very nice on the reflective side. I also find the small amount of light that passes through the material nice as well, as there is a fabric like mesh pattern in it that is subtle and attractive. As a shade material it is really excellent, in that it transmits just a little light for presence, while reflecting the rest very efficiently. 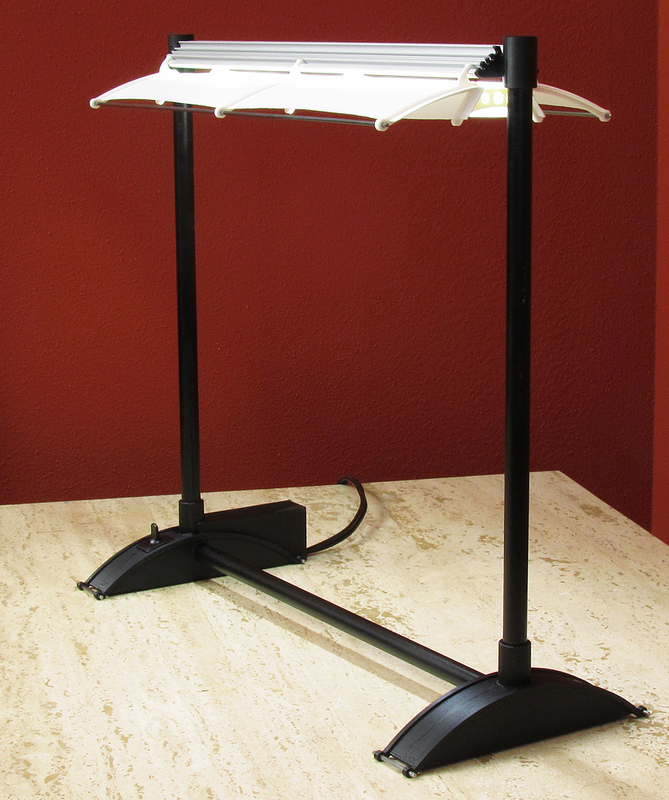 The little lamp is only 16″ tall. One of the features I looked at carefully was visibility of the light source. 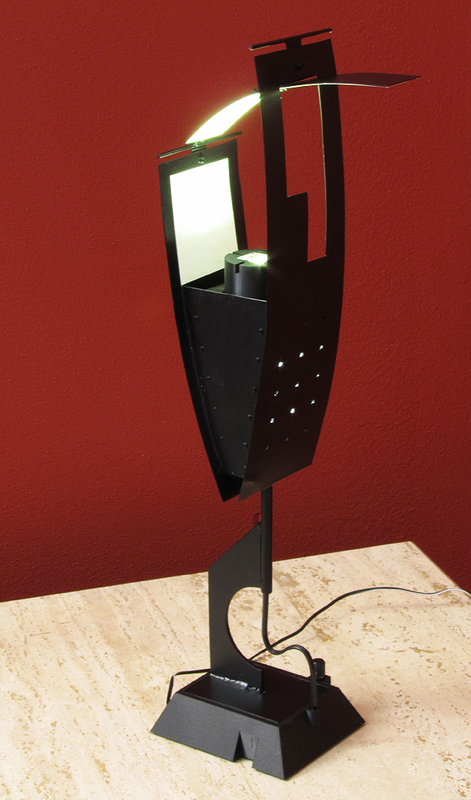 The wrap around shade, closed top and bottom, and cutoff geometry means that the light source is completely concealed from any viewing angle. 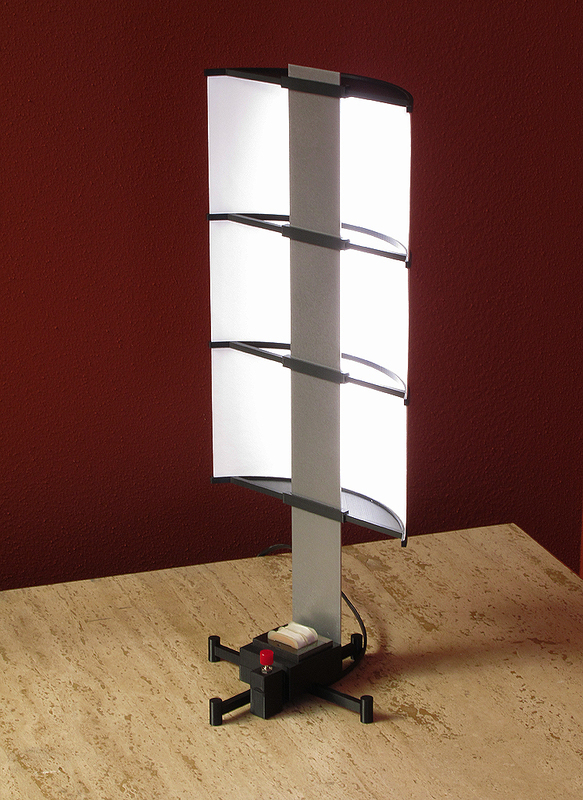 Like a conventional table lamp, it can be oriented in any direction without exposing the light inside. However, in this instance, the decidedly asymmetric distribution provides more useful versatility than a conventional table lamp. Aim the reflective side toward the room and use the light to act much like a photographers soft light, emitting diffuse fill light into the space. The size of the shade and even distribution of the LynkLabs strip offer a bright, but pleasant glow. From the back, the shade produces just a little light behind on the wall, or if its viewed from behind offers a nice pleasant appearance. This iteration of the design is decidedly minimalist, with the transformer visible from the lower housing and the switch exposed without any hint of refinement or attempt to conceal any of the components. The heat sink is nothing more that a 2″ wide strip of aluminum. The end product is low in cost and lightweight… and fun. Oh yeah, since the transformer is a typical magnetic unit, dimming from a wall box dimmer designed for control of inductive loads will do the trick, at less cost than electronic load dimmer controls. Some people fold paper, others doodle on the corners of note pads. I fiddle with metal, plastic, solder, wires and LEDs. Design often requires ignoring any practical uses or goals, and just let things flow, even when the result is odd and quirky. This definitely qualifies in this regard, and was pursued with little real regard for refinement or practical evolution. This is a 3D sketch for all practical and impractical purposes. Actually it started as a pencil scribble on union skin tracing paper that was both goofy and compelling at once. The intent was to put that sketch into a physical form without spending a great deal of time fine tuning, refining, or iterating it into something practical. This includes rendering the surface finish as though it were sketched in air using a black crayon or charcoal stick. Most of the parts used in this effort were from spares bins and scrap metal that just happened to fit the loose scribble, including the collection of lighting parts. 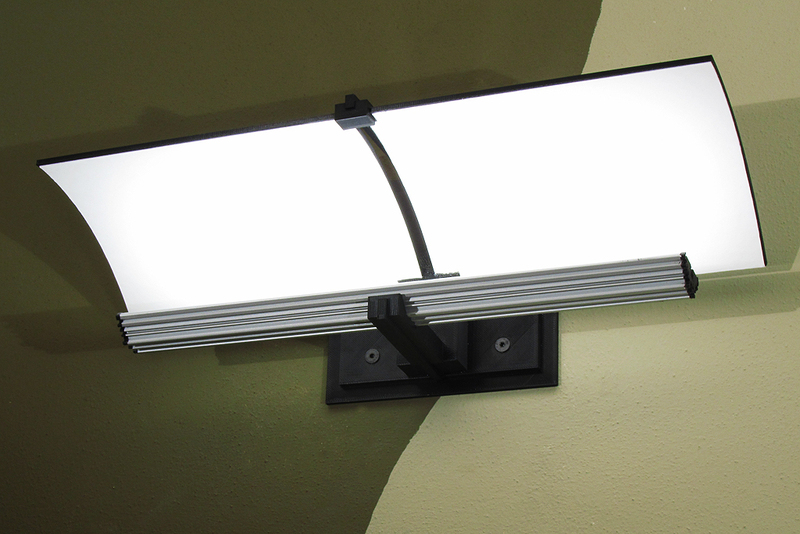 The uplight LED is a Lumileds K2, while the interior light is provided by a Seoul Semiconductor P3. The two odd neighbors are wired in series. I figure the two can fight it out for their share of voltage from the 700mA driver located in the base along with dimmer. 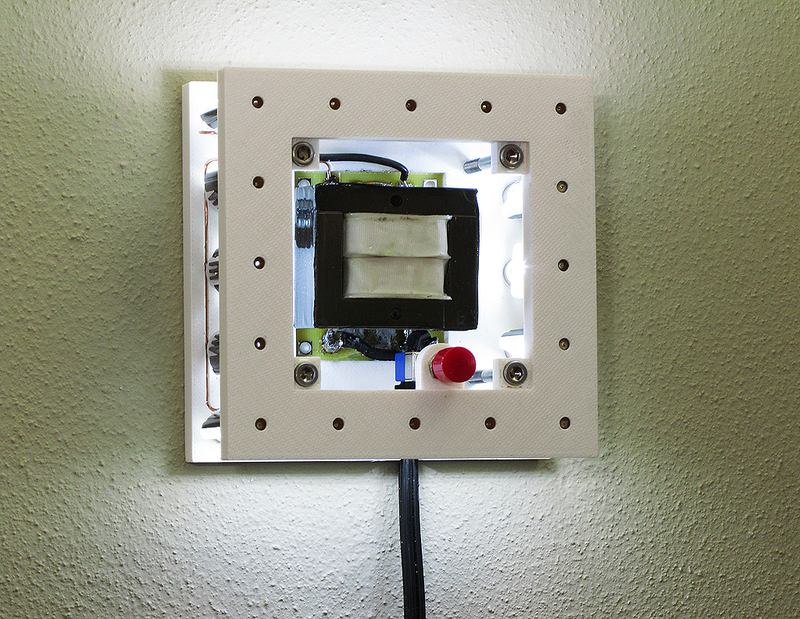 The main power supply is a spare universal 12VDC wall wart. Paint is a combination of textured Rustoleum Hammer-rite that was then over-sprayed with John Deer matte black while still wet to produce a surface with a charcoal impression, like it was sketched in space, much like charcoal and crayon appear on paper. 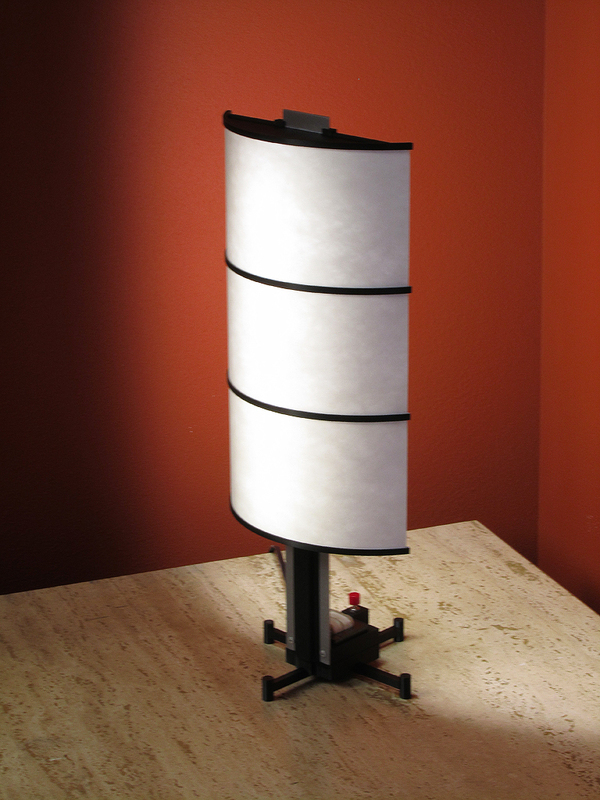 The white reflective areas are white optics diffuse material and provide a stark contrast, like an area of paper undisturbed. I thought about writing some message on the back panel, or signing it, or sketching a doodle on it, but couldn’t decide what, so will leave it blank for now. As rough sketches go, this has a little whimsy to it, and for me is compelling and curious at once – just the sort of thing I like. 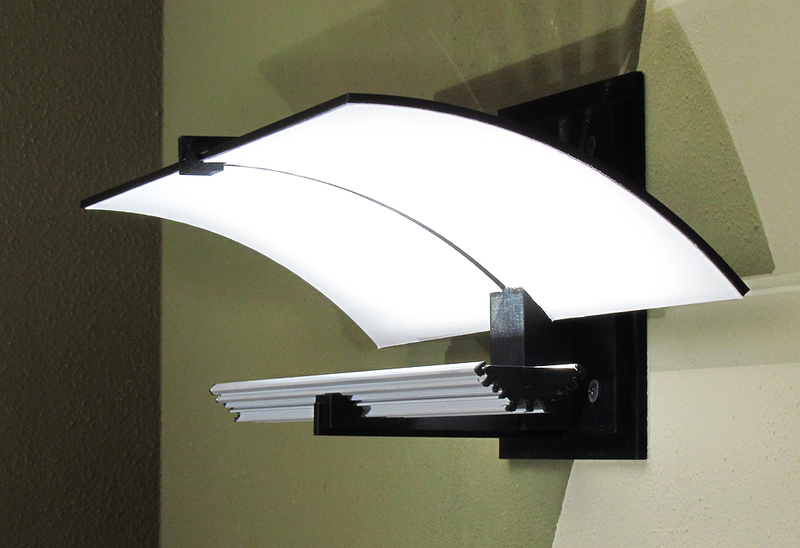 It’s certainly not going to be found in a local lighting showroom, and will not be duplicated, so is a true one-off. For some that might be welcome relief, for me it’s just an exercise, and a way of letting things go, in an industry overly wrapped up with metrics and doom aversion to have fun with what it has in front of it. While creating this small pendant I couldn’t help but think that had LEDs happened in the 1980’s, they would have exploded in popularity much faster than we are seeing today. Between hi-tech styling, the openness of the market to accept new design, remnants of disco, and the pace of construction then were strong, while the need for energy efficient products that were not wimpy little 9W twin tubes or gastly white energy saving tube fluorescents was high. Hi-tech and LEDs work so well together, its a shame that todays stripped clean, commercial kitchen aesthetic really throttles use of new technology to produce exciting new things, unless of course they are white with brushed white metal trim (yawn). Can you imagine what Disco would have been like with LEDs? Color Kinetics would have become the size of Microsoft! In any case, this design is actually quite simple. 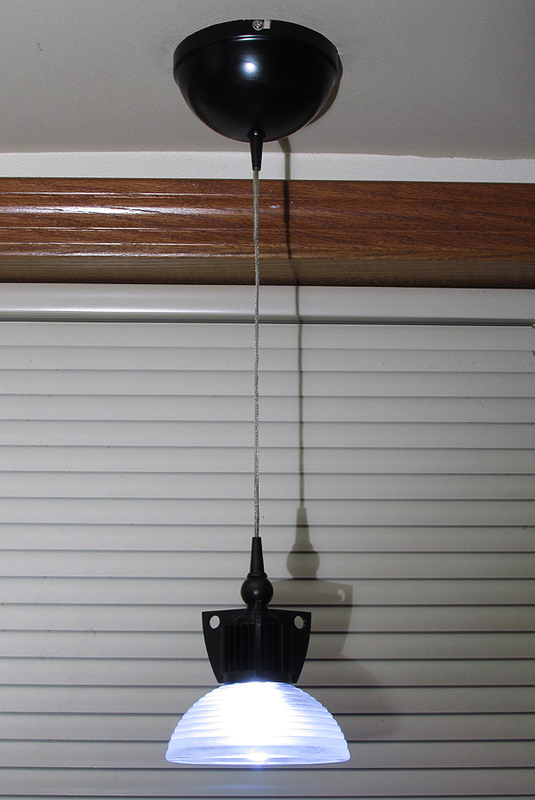 It is a small pendant for over a kitchen sink or counter, using a Bridgelux LED in a 4.5″ ribbed and etched glass shade, and Dialux driver in the canopy. I am driving the LED at only 350ma, as this is all the light I need here, at 27Fc on the counter below. The ribs in the shade produce the impression that the light source is suspended inside the shade, when it is actually in the head above. The light piping into the glass causes the illusion, while location of the LED higher up creates some shielding. The result is their is more light provided on the surface below, and less brightness in the shade. The cable is shielded communications cable with internal wire, using the braided jacket as the negative conductor – very 1980’s.